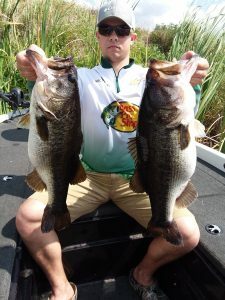 Dane Overfield and Nick Binnert sure had a good day with Okeechobee Bass Fishing catching these 2 beasts. The one on the left weighing 8 lb 2 oz. and the one on the right weighing 9lbs. 9 oz.. We also caught several other nice fish to complete the day at nearly 50 fish total. The bite had been red hot and the big fish are starting to show up as the lake level drops and the Spring spawn turns on. That is is 5 fish over 9 lbs for our team over the last week. Give us a call today to book your trip to catch that fish of a lifetime!